Rosh Hashanah will be celebrated on Sunday, September 9 (6:30pm service), and Monday, September 10 and Tuesday, September 11 (8:00am service start both days). Yom Kippur begins on Tuesday, September 18 with Kol Nidre (6:15pm service) and then Wednesday, September 19 (9:00am service start). Our services will be conducted by Rabbi Matt Carl and Cantor Sam Levine, along with returning Assistant Cantor Julia Ostrov in our beautiful Sanctuary. We invite you to join us. For each seat in the Main Sanctuary, a ticket is $125 for members and $175 for nonmembers of East Midwood Jewish Center. Each ticket covers all Rosh Hashanah and Yom Kippur services. You can order tickets online at our Square store here, with a check or credit card via the office. If you attended last year, you may request the same seats. We will mail tickets to you, unless you request otherwise. August 14, 16, 21, 23, 28, 30, September 4, 6. • Attendees with hearing difficulties: Our ushers will provide a very useful headphone listening device at no charge. If needed, please let us know when ordering your tickets. 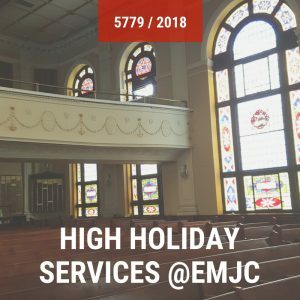 • High school and college age youth visiting from out of town are welcome to attend all our services at no charge or may get together in the Beth Hamidrash for their own services. Reservations are required to guarantee seating. You will be assigned to the sanctuary’s balcony as space permits. o Ages 0-6 and their parents: We offer either an informal creative play New Year program, led by early childhood specialist Joanne Riel, starting at 10 am in the 3rd floor Playroom, or our parent-led Rosh Hashanah Katan Service in the Dr. Fersko Room on the 3rd floor from 11 to 11:45 am both days. o Children ages 8-13: Audrey Korelstein, EMJC’s Director of Youth & Family Education, will guide children ages 8-13 through an age appropriate exploration of the meaning of these holy days. This program will take place in the Dr. Fersko Room on the 3rd floor from 10:30 to 11 am. On Rosh Hashanah, all the young children’s services conclude with apples, honey, juice and challah. o The 4th annual family potluck picnic will take place on September 11, after services. o On Yom Kippur, the Regency Room on the second floor will be set up as a quiet space to support family members who are attending Sanctuary services. Following Joanne’s and Audrey’s programs, children will relocate to the Regency room for conversation, quiet play and board games. Children under Bar/Bat Mitzvah age will be served a simple lunch. • Children’s Programming Support: Although our High Holiday services for children are free, we would appreciate a donation in support of these important programs for families. Best wishes to you and your family for a shanah tovah u’metukah, a happy, healthy and sweet 5779. We look forward to greeting you at our beloved shul during Rosh Hashanah, Yom Kippur and other occasions. *All youth & family services conclude with apples, honey, juice, and challah.